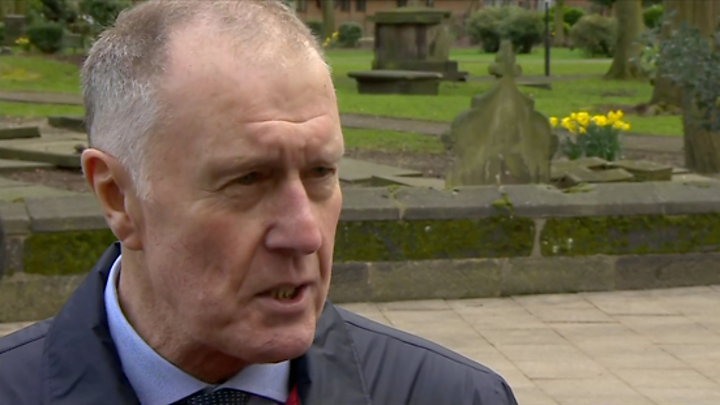 World Cup final teammates of England goalkeeper Gordon Banks have attended his funeral, including hat-trick hero Sir Geoff Hurst whose eulogy described him as a "superstar". Hundreds of people lined the streets of Stoke-on-Trent as a cortege made its way around the city. 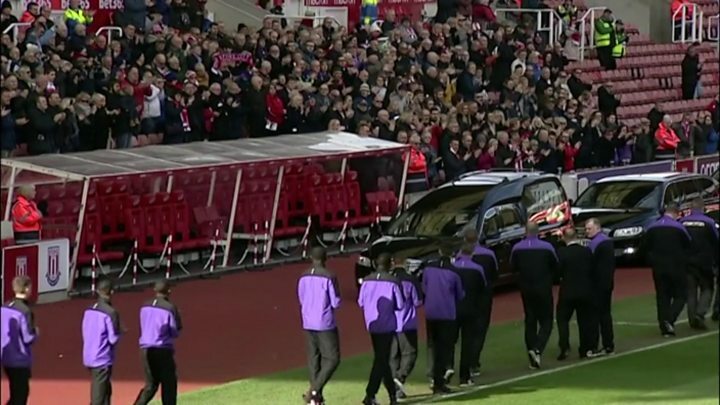 The coffin was also driven to the home of Banks's former club Stoke City where hundreds more chanted and applauded. Jack and Sir Bobby Charlton were among mourners at a later church service. The brothers - who won the World Cup with Banks in 1966 - attended Stoke Minster where Wembley teammate Hurst paid tribute. Hurst said it was a "very sad day", describing his former teammate as the "greatest goalkeeper we've had". The funeral started with a rendition of Abide with Me - a hymn synonymous with the FA Cup final. Monday's service was held on the 47th anniversary of Stoke City's 1972 League Cup final victory over Chelsea in which Banks played a leading role. Before the funeral, members of the public stood five or six-deep on pavements around Stoke-on-Trent, with people inside the bet365 Stadium chanting "England's number one" as Banks's achievements were displayed on a big screen. His coffin was carried by goalkeepers from his three ex-clubs, Stoke, Leicester City and Chesterfield. 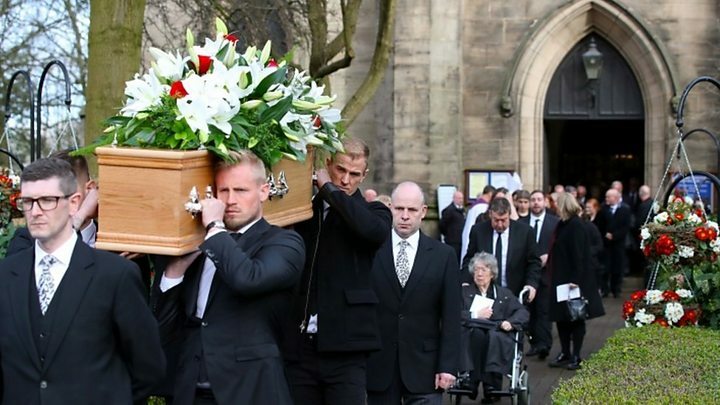 The pallbearers were Stoke and England goalkeeper Jack Butland; Leicester's Kasper Schmeichel; Chesterfield keeper Joe Anyon; and England and Burnley's Joe Hart. The service ended with a recording of the song My Way performed by Frank Sinatra. Banks, who died on 12 February aged 81, started his career at Chesterfield before joining Leicester City in 1959 for £7,000. At Leicester, he established himself as England's number one, earning his first international cap in 1963 against Scotland. Fifa named him goalkeeper of the year six times and he earned 73 caps for England. Hurst delivered a eulogy, describing Banks as "a superstar on the field, [but] off the field he was an ordinary guy with no airs or graces". He added: "He was a joker, a funny man, for over 50 years, and every time we met during our careers or years after he would come up and joke." Stoke City chairman Peter Coates told mourners: "We regard him as our adopted, famous son. "He was fully integrated into the community at all levels and he was at home with us and we were at home with him." Banks's daughter Wendy said the outpouring of love had been a comfort, adding: "It makes you feel very humble and proud all at the same time." "It was football, Match of the Day and laughs; I miss everything already," she said.